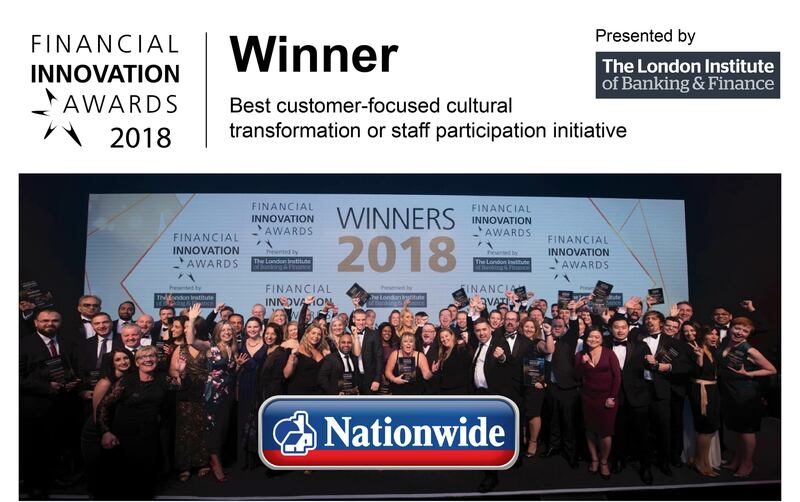 Horizn is pleased to share that the Nationwide Building Society Colleagues Discover Mobile platform, powered by Horizn Knowledge Platform, led Nationwide Building Society to win the Best customer-focused cultural transformation or staff participation initiative award at this year’s prestigious Financial Innovation Awards. This event was hosted by The London Institute of Banking & Finance, in London, in December 2018. The Horizn Knowledge Platform equips Nationwide Building Society colleagues with the knowledge they need to improve the member experience, humanize digital banking and increase digital adoption. Each time Nationwide Building Society launches a digital capability to its members, it’s essential that both members and colleagues understand how it works. “We are excited to support these initiatives with Nationwide Building Society in the UK and are very proud to win this prestigious Financial Innovation Award for Nationwide’s Building Society Colleagues Discover Mobile,” said Janice Diner, Horizns’ CEO and founding Partner. “These hotly contested awards recognise companies for their development of innovative products and projects that empower consumers, communities, and businesses around the world. Congratulations to all the winners!” said Alex Fraser, CEO at The London Institute of Banking & Finance. The Financial Innovation Awards, held on Thursday, 6 December at Hilton London Bankside, recognises some of the most innovative companies in the banking and finance sector. This year, 102 companies were shortlisted for awards in 17 categories, covering: products & services; marketing & customer experience; finance in the community; technology; and the best financial start-ups. Fifty percent of the companies shortlisted were from the UK, while the other half were international, including from the UAE, Canada, Thailand, and Brazil. The London Institute of Banking & Finance has been at the heart of the finance sector since 1879. They’re a professional body and registered charity, incorporated by Royal Charter. LIBF is an awarding body for industry qualifications covering a wide range of subjects, including banking, regulation, asset finance, trade finance, investment and financial advice; in the UK and internationally. Nationwide is the world’s largest building society, as well as one of the largest savings providers and a top-three provider of mortgages in the UK. It is also a major provider of current accounts, credit cards, ISAs, and personal loans. Nationwide has around 15 million customers. Members can manage their finances in-branch, via the mobile app, over the telephone, on the internet, or via post. The Society has around 18,000 employees. Nationwide’s head office is in Swindon, with administration centres based in Northampton, Bournemouth and Dunfermline. They also have a number of call centres across the UK.